The Datavideo TLM-700HD-S2 7" LCD Monitor with S7000F Sony Battery Mount features a 7” wide screen TFT panel, NTSC/PAL support, and LED life of 20,000 hours, and produces high-quality images at a resolution of 800x480. It offers a contrast ratio of 500:1 and a brightness rating of 300 cd/m². A wide viewing angle of 60/-40° (V) x ±60° (H) ensures that you can view images clearly from any corner of the room or when the display is mounted at a height. Featured ratio settings allow for switching between 16:9, 4:3, and 15:9 aspect ratios. The Blue only feature switches off red and green scan guns to produce an image made only from a blue scan gun. With the time code mode, you can view the time code on the screen. In addition, the unit supports VITC (vertical interval time code) type of time code. Featured dual color tally system indicates different program statuses. Equipped with an integrated color bar, the TLM-700HD-S2 LCD monitor enables precise and accurate screen calibration. Multi-language OSD (On-screen Display) offers intuitive and convenient interface for adjusting settings such as contrast, brightness, color, and tint (NTSC only). The TLM-700HD-S2 LCD monitor supports connections such as HD (high definition), SD-SDI (serial digital interface), HD/SD YUV, and HDMI/Composite Video input, thereby offering all-round connectivity. 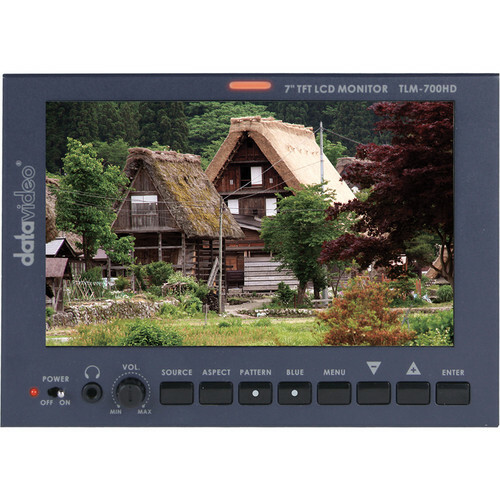 With a rugged metal design, the LCD monitor is suitable for HD/SD applications such as outdoors in field and production studios. The S7000F Sony battery mount is compatible with SWIT S-8972, S-8970, S-8770, and Sony BP-U60/BP-U30 DV batteries. In addition, the battery mount features open end DC wires in the back to connect with the equipment. Box Dimensions (LxWxH) 11.3 x 9.6 x 4.6"
Any quality NP-F battery will work. The lowest cost batteries probably will work but be prepared that they may not.